Few would argue that The Void has been vital in nurturing our Kendama scene to where it is today. 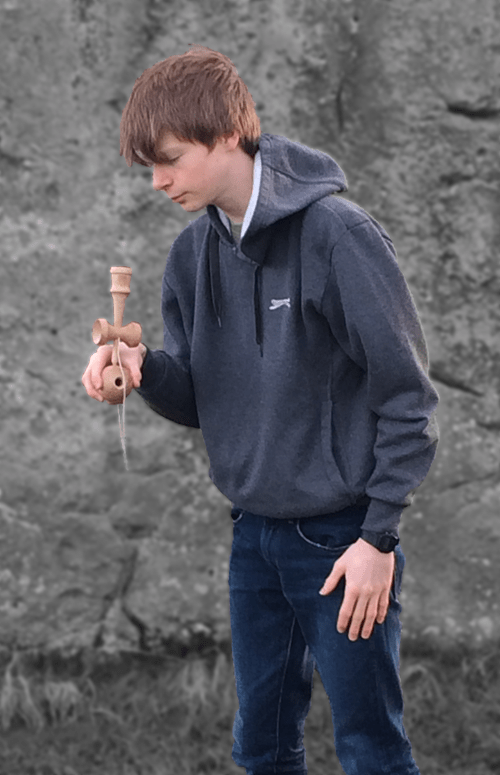 His passion for playing and exploring the possibilities in the kendama world is infectious. The Void has been teaching and performing kendama since way back. 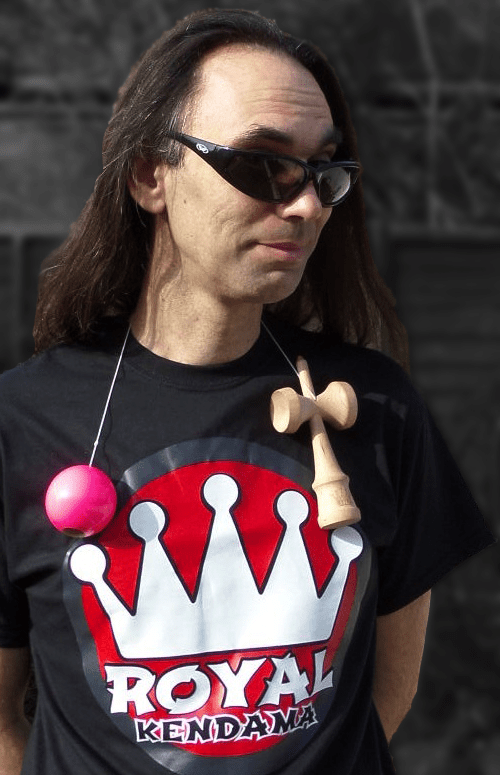 He is a two-time British Champion, author of a kendama trilogy of books, founder of the British and European Open championships, and the first Westerner to gain any JKA Dan grading: first to hit 3rd, 4th, & 5th Dans, and then, in 2017, became the first (& so far only) non-Japanese player to gain the highest exam grading of 6th Dan. Rob: What is the key to Kendama success? – I know it’s a tired old cliché, but… Knees! I literally can’t say this enough. I’m CONSTANTLY amazed at seeing really good players miss tricks because they are just lazy about bending their knees. Plus, dedication, practice, playing together with friends, and loving what you’re doing. If kendama is boring you, put it down, have a break, and come back to it when you’re feeling more inspired. Sam: You are stranded on a desert island. How long until you whittle yourself a kendama? Ingi: Who got you into kendama/how did you come to play this lovable toy? – I’d already been a juggler for 14 years when my juggler friend Matt Hall ran a kendama workshop at the British Juggling Convention in 2006. I learned the Kyu tricks from him, plus a few more, and then started using kendama in my walkabout performances. In late 2007, I discovered internet clip videos of Japanese players doing astounding tricks, and I was then completely hooked. R: What else do you do outside of Kendama? – I like to play poker and scrabble. I used to love to snowboard, but somehow I haven’t been for 13 or 14 years, so I guess that boat has sailed. I used to read a lot, but now I spend way too much time on the internet. Listening to BBC Radio 4 & watching BBC 4. Watching cricket (specifically Middlesex) whenever I can find the time and money. (Or if not, then listening to the commentary – The pictures are so much better on the radio.) Going to juggling conventions. S: What is the ideal food and drink accompaniment to a day’s practice? – Croissants for breakfast, with orange juice. Cheddar, tomato, lettuce & pickle in a baguette for lunch (with a milkshake). Mid-afternoon café latte (Can’t have the coffee too early – it can affect my kendama play). Right now, I like the idea of a veggie nut roast for dinner (There had better be roast parsnips!). I: If you could play anywhere ever with any kendama, where and what would you play? – This is the toughest question in this interview! I’ve had so much kendama fun with so many people, and been lucky enough to play with a lot of different kendamas, that’s it’s difficult to think up an imaginary scenario that would top them all… Okay then… WHAT: A special custom Royal kendama that currently exists only in my head. WHERE & WHEN: The Universal Space-Time Kendama Championships (Venue: Milliways). Every player from the past, present and future is invited to a month-long event of ultimate technical, competitive, videographic, challenging, but ultimately fun and social kendama madness. Wooo-hoooo! Paul: If for you kendama comes first, what comes second? – Wow. Hmmm, does “kendama come first?”, I ask myself. Life is a lot bigger and rounder than kendama, but if I can add “…as a plaything” into your question, then… 3 club juggling. I’ve played with loads of different toys and juggling props over the years, but if I had to pick one (instead of kendama) then that’s the one I keep coming back to. You can check out my routine here, if you like. Whilst only a relatively recent convert to The Way Of The Kendama, Ingi has embraced our favourite little toy avidly. Passionate about spreading the kendama love far and wide, to all and sundry, she is especially keen to encourage more female players to get clicking. In her first competition, Ingi won the Beginner division at the European Kendama Open. Onwards! Rob: What are your goals for Kendama? – Play it. All the time. And to have fun and to share kendama. I’m convinced that it’s a form of meditation. To hone your body to do the incredible things people can do with kendama. It’s a world for so much creativity and expression to happen. Kendama is colour and sound, touch, movement; kinda like Lego but wooden! Sam: If you could go anywhere in space and time to get the perfect shot where (and/or when) would you go? – I would stand in an electrical storm on the satellite moon of Jupiter named Io, I’m well into it and if I could survive the atmosphere and the wind wouldn’t throw my mad moves, I’d chose there. R: Who/What inspires you in Kendama? – I’m a huge fan of Jake Weins coz he jams so pretty like and Chelsea May Perez is a frickin legend and totally my idol. My friends and their support is super nice and the Royalists yo! Got a slamming team here! – I was sired (like a vampire but with kendama) by my friend Jimmy whom I work with. He got into kendama a year or so previously and was having a bit of a jam at work and I couldn’t get it out of my head so I bought myself a Shin Fuji and haven’t looked back! S: Describe your “I can’t believe I just nailed that trick” dance. Paul: Who inspires you musically? – I like all kinds of music but I really like Burning Spear at the moment and I recently rediscovered Anaïs Mitchell. Ooo and Joan Armatrading. And classical music- old latin songs that people sing in cathedrals! And gotta love Sardinian throat singing! So yeah pretty eclectic music favourites right now. Matt is a three-time British Champion, and consummate freestyler & Dan Jammer. Representing the British & European scene hard since the days of “Ken what?”, Matt’s been a Super-Staller and an Around-Amazer for a decade, and it’s our pleasure to welcome him as a Royalist. Void: What’s the best thing you’ve got out of being a kendama player? – It would probably be seeing different parts of the world which I wouldn’t have seen unless I had the excuse of a kendama event to attend! Great trips that stick out in my mind are Munich, Amsterdam, and Copenhagen. As fun as a kendama event is, I’ve always tried to bolt on a day either before or after an event for some tourism without a kendama glued to my hand. If it’s a new location for a kendama event, it’ll draw me towards it that much more! Rob: What reason do you have for picking up a kendama as often as you do? – I’m an English teacher, so a large part of my job is planning lessons/creating material at home; and (as any teacher will tell you) it is a never ending job. Bearing that in mind, I always keep a kendama next to my laptop, beside my books, and in my car, which I use as a tool to tear me away from my responsibilities (even if it’s for just 5 or 10 minutes), serving as a constant reminder that there is more to life than only working! – I would describe my playing style as technical, as I’m not that flamboyant. I would love to say otherwise, but kendama is my first and only skill toy/juggling hobby! I did rollerblade for about 10 years, where I was always a fan of technical switch-ups (changing between grinds) on very low obstacles, opposed to flinging myself down flights of stairs. Although it may be a bit far-fetched to say that avoiding broken bones founded my inclination towards subtle dexterity instead of “bangers”, I am a fan of tenuous links. V: Which thing that you have lost would it make you happiest to find again? – My music! When I left the UK in 2014, my computer got wiped, and I lost everything. Years of scrounging, downloading, purchasing, searching, stumbling across and sharing… Gone. I have had to start rebuilding my library again, but without my university housemate (who was a music enthusiast), it is a slow process. R: Why are you so good at Birds and Wings? Tell us your secrets! I: Can you describe the feeling of winning a competition and what it means to you to perfect your dama craft? – Pride! But also a sense of guilt for knowing that you were the one to rob that feeling from your competitor, which taints the victory a little bit. As for perfecting the dama craft (or any craft for that matter), I feel sorry for those who do. Although you can still enjoy jam sessions, you’ll lose that gratifying feeling which every individual can identify with: levelling up. Kendama players are fortunate in that aspect, as although you could perfect an area of the craft (such as moshikame, juggling, stalls etc. ), there are always new areas being discovered and boundaries being broken. We all have something new to learn! Paul: Which were your favourite subjects in school/university and why? – My top subjects from school were definitely Physical Education (probably stemming from being a little competitive), and Psychology, as people are insanely complex and interesting when you dig a little deeper. It’s probably why I went on to study Sports Psychology, which focussed on how people are motivated not only on the sports field, but also in their daily lives. It hasn’t proven very useful when progressing a specific career, but it has helped in all aspects of my life to some degree. 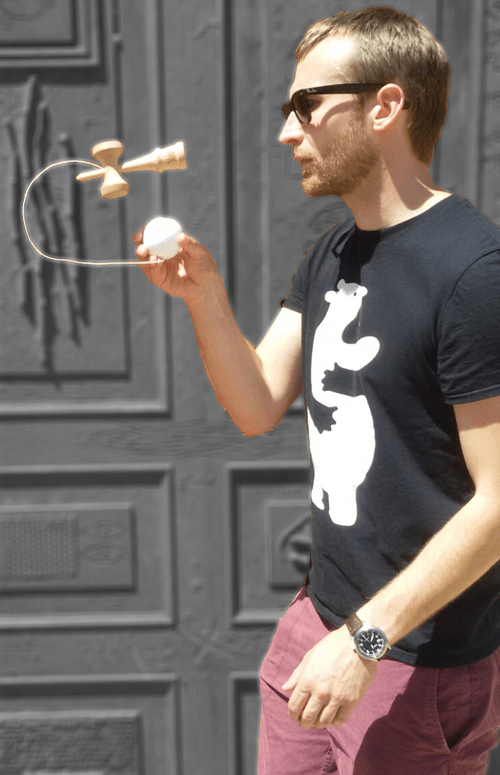 Ingi: What is it about kendama that keeps you jamming for ages? 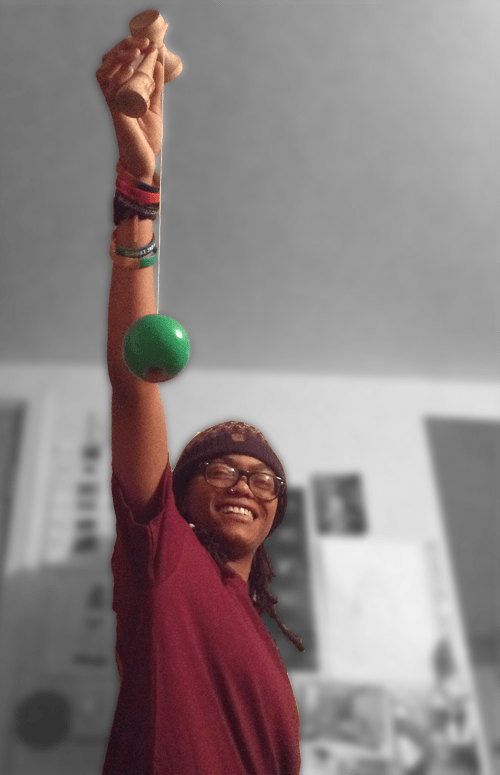 – Kendama for me is all about progression, all about trying for one trick over and over until you get it. After jamming for an enormous period of time, the sense of achievement when you land it, is like no other. I keep jamming for this relief. Kendama is also a great tool for just filling time. Need ten minutes? I just go click click click, sometimes just for that one trick, sometimes just for consistency and long combos. Hitting even the simple tricks are great stress relief. And this is why I have kept jamming, for all this time, for 3 years. Void: What are your aims in kendama… over the next 1, 5, 10 years? – I don’t really have any current aims, I’ll be trying to keep my titles as British and European champions next year and am hopefully going to be giving it a shot for the UK during the next World Cup. But in the long future? I hope to still be playing and competing and progressing in kendama, teaching and spreading the joy this toy can bring! Sam: What trick is your Everest? The trick on your list that seems insurmountable right now but that must be done! – A simple one for me, Boarder Balance Flip. Back at the last EKO, Jak, Sweets and I were all just trying to get this trick, all three of us were trying all week to get it and none of us fully succeeded. Can’t say that I haven’t been close though, at EKO I did manage to hit it but the spike was only balanced for not even a second. Ever since I have been determined to conquer it. I: How many kendama do you own? Do you do customs/paint your own? – I currently own 38 kendamas of all shapes and sizes, some I play with a lot, a couple not at all. I have tried custom painting once and it did not go too well. Tried a second time and it was even worse! V: If not “Kendama Player”, what job do you want when you leave education? – When I leave school I would like to go in to film production, filming, editing, directing, anything really, I find it all fascinating! I’ve worked on a few short film projects before and loved every second of it, I would love to continue with the making pieces of film that everyone could enjoy. S: You must show the Queen one trick! What trick do you do? – I’ve always considered my signature trick of mine as the swirl combination with leg and back catches. (Swirl with catch under the right leg > swirl with catch under the left leg > swirl with catch behind the back > swirl > little cup string pull > in). It’s always been my crowd pleaser at competitions and to those who have never seen a Kendama before. This is the trick I would perform. Paul: Describe your most memorable trick you’ve landed. – I was at a meet talking about the difficulty of landing border flips. After having a couple of attempts and getting nowhere, for a laugh, I moved on to trying border juggle border… second go I hit one, kept the balance for a few seconds before missing the spike – I then realised that these were more doable than the ‘standard’ flip so I immediately tried again hitting one even cleaner and getting the spike afterwards too! It was quite a surprise! Ever since it’s taken me at least 10 to 15 minutes to get one, let alone 2 in a row! Check Out our Royalists doing their killin’ kendama classy clicks. If this whets your appetite, then head over to the our YouTube channel for more Royalmania.